Railway Recruitment Board has released the Assistant Loco Polit (ALP) examination schedule. 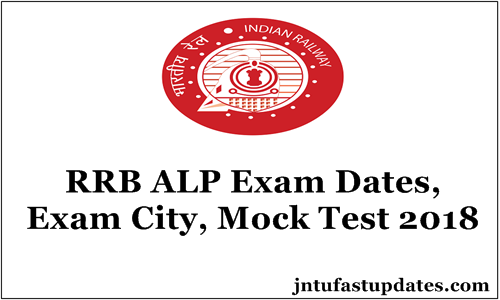 For the ALP examination board, the RRB has released the detailed scheduled of examination dates, cities, and mock test dates. Applicants can check the details of RRB ALP exam schedule and complete details from this article. Annually the RRB is going to offer a huge number of jobs for the aspirants. This year the RRB has released the 26502 ALP/Non-Technical Grade III posts. A huge number of aspirants seeking for the Railway jobs have applied for the RRB Loco Pilot Technician Grade III vacancies. RRB is the national level recruitment board known as Railway Recruitment Board. Totally Railway Recruitment Board (RRB) has 21 boards which work with it for selection of eligible candidates into various RRB departments for various parts of India. The sub-boards of the Indian Railway Recruitment Board include RRB Ahmedabad, RRB Kolkata, RRB Bangalore, RRB Ajmer, RRB Mumbai, RRB Secunderabad, RRB Bhubaneswar, RRB Allahabad, RRB Bhopal, RRB Chennai, RRB Bilaspur, RRB Chandigarh, RRB Guwahati, RRB Gorakhpur, RRB Jammu and Kashmir, RRB Malda, RRB Muzaffarpur, RRB Ranchi, RRB Patna, RRB Thiruvantha-Puram and RRB Siliguri. RRB is going to conduct the 1st CBT ALP examination on 9th August. Later this examination will be conducted in many examination centers across various RRB regions. RRB is going to organize the Computer Based Test (CBT) for the aspirants. Initially, candidates can give the RRB ALP mock tests to check their accuracy and knowledge about the examination. The Railway Recruitment Board has opened the mock tests from 26th July. Applicants can check more details about the RRB ALP Mock test guidelines, hall ticket availability date, and other major instructions for RRB ALP examination from this article. Hope this article gives the prominent information for the RRB ALP applicants. Candidates going to appear for the RRB ALP written test have to carry the admit card/hall ticket along with them while going to the test. Aspirants can check the details of examination center and date, timings of the examination clearly from the admit card. Applicants can download RRB ALP Grade III technician admit card from the RRB official portal. The hall ticket/admit card will be accessible to download from 4 days before the examination date. Candidates have to carry the admit cards while going to the examination center. Also, carry any of the valid identity proof copy such as Aadhar card, PAN Card, driving license etc along with the admit card. Candidates have to report at the allotted examination centers 30 minutes before the examination date. RRB is going to launch the mock tests from 26th July. By signing into RRB website candidates can carry out with the ALP mock tests. With the dummy user id and password, the applicants can attend the RRB ALP mock test. Duration of the mock test is 1 hour. The clock will be displayed on the screen. It will match with the server time. The timer will be started when the examination is started. The timer continues while answering the questions. If the timer reaches 0, the examination will be ended. “Marked for Review” appear means then it means you want to look at it again. When you click “>” arrow that is at the left of the question then it collapses the question and you get a maximized question window. If you click on “< ” arrow towards the right side of a question then question palette comes again. In order to change the language, click “Profile” image which is at the top right corner. Here you get a drop down and you can change the language. Initially, go to any of the question numbers in any of the palette. Mark the suitable answer and click on save and next. If you click on the mark for review then you mark for review and go to next question. Click on the answer button which you want to mark. If you want to remove the selected answer then click on clear response button. Now if you want to select another answer then click on the button. Now, the competitors should click save and next button to save answer. Select mark for review and next button to mark for review. How to navigate through sections? The section names will be given on the top bar. By just clicking on the section you can reach that section and answer the questions from it. Shuffling between the sections is possible. Section summary appears in every section above question palette.